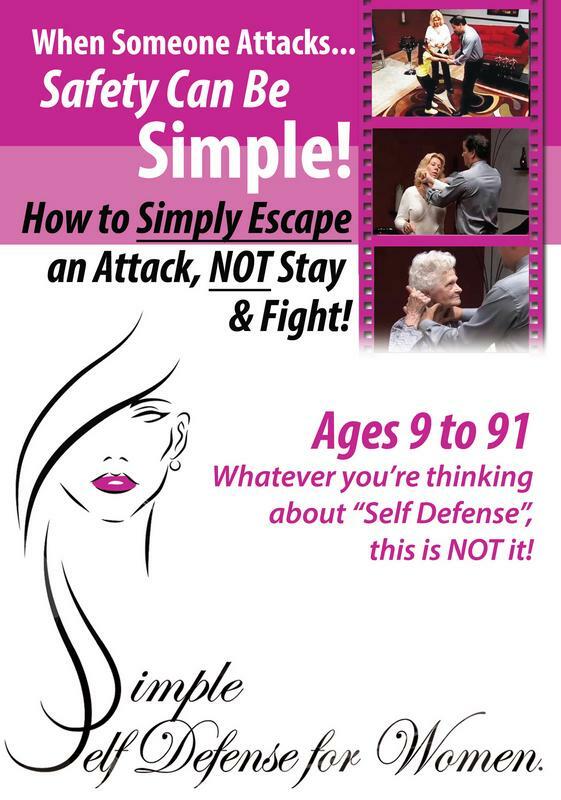 How to Simply Escape an Attack, NOT Stay & Fight! Own a copy of the TV Show everyone is talking about. The show that takes a serious topic but keeps it entertaining! Same techniques taught at our workshops and seminars. Easiest to follow for all ages! This is the DVD as seen on TV and the most popular! Use this Safety Door Stop Alarm to block a door from being opened, if anyone tries to open the door, the alarm will sound. Movement sensor with adjustable sensitivity to activate the alarm if tampered with. An on / off switch allows the alarm to be turned off so that it doesn't go off in your luggage. Dimensions: 1.65" x 5.43" x 1.38"
- Why do I need pepper spray if I am using your techniques? engage in the first place. Another reason is that it is non-lethal if you should spray someone by accident. - What is the difference between pepper spray and mace? effective because it causes your eyes to swell vs. being irritated. - How long does pepper spray last? Each manufacturer may differ but we recommend, it should not be more than five years old. - How many shots do I get with your pepper spray? 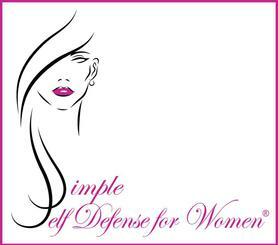 All of our products and services have one goal in mind, and that is to help keep you, your staff, your clients and your children safe! We price our security products $20.00 dollars or less where most everyone could afford it. Please don't wait until its too late. All it takes is a few seconds for something bad to happen to you to change the rest of your life! Please take the time to invest in your personal safety and help prevent a tragic event from happening to you or someone you care about. 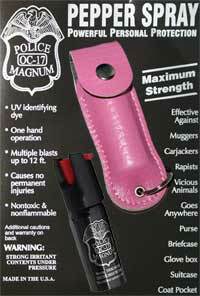 In Canada all products with a label containing the words pepper spray, mace, etc., or otherwise originally produced for use on humans are classified as a prohibited weapon.Only law enforcement officers may legally carry or possess pepper spray. Any similar canister with the labels reading "dog spray" and/or "bear spray" is regulated under the Pest Control Products Act - while legal to be carried by anyone, it is against the law if its use causes 'a risk of imminent death or serious bodily harm to another person' or harming the environment and carries a penalty up to a fine of $500,000 and jail time of maximum 3 years. In California, the container holding the defense spray must contain no more than 2.5 ounces (71 g) net weight of aerosol spray. In Massachusetts, residents may purchase defense sprays only from licensed Firearms Dealers in that state, and must hold a valid Firearms Identification Card (FID) or License to Carry Firearms (LTC) to purchase or to possess outside of one's own private property. It is classed as "ammunition",unlicensed possession of which is punishable by up to 2 years in prison. The state of Michigan allows "reasonable use" of spray containing not more than 10% oleoresin capsicum to protect "a person or property under circumstances that would justify the person's use of physical force". In the state of New York, pepper spray may be legally possessed by any person age 18 or over; however, it must be purchased in person (i.e., cannot be purchased by mail-order or internet sale) either at a pharmacy or from a licensed firearm retailer (NY Penal Law 265.20 14 (a)), and the seller must keep a record of purchases. The use of pepper spray to prevent a public official from performing his/her official duties is a class-E felony. New Jersey allows non-felons over the age of 18 to possess a small amount of pepper spray, with no more than three-quarters of an ounce of chemical substance. In the state of Washington, persons over 18 may carry personal-protection spray devices. Persons over age 14 may carry personal-protection spray devices with their legal guardian's consent. In Wisconsin, tear gas is not permissible. By regulation, OC products with a maximum OC concentration of 10% and weight range of oleoresin of capsicum and inert ingredients of 15-60 grams are authorized. This is 1⁄2 and 2 oz (14 and 57 g). spray. Further, the product cannot be camouflaged, and must have a safety feature designed to prevent accidental discharge. The units may not have an effective range of over 20 feet and must have an effective range of six feet. In addition there are certain labeling and packaging requirements: must state cannot sell to anyone under 18 and the phone number of the manufacturer has to be on the label. The units must also be sold in sealed tamper-proof packages. In many (but not all) other states, pepper spray can be purchased at various stores and carried legally by anyone over 18. $4.95 Shipping & Handling to all 50 States, and Puerto Rico, via the United States Postal Service First Class Mail. 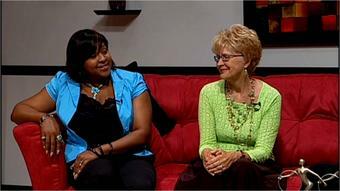 Interested in having us personally speak at your next conference, meeting or conducting a workshop in your area. The Power of Safety is in this Pocket Size Book! Pink color is standard. Blue and Green while supplies last. Please indicate your color preference when ordering.